SSC CGL Exam Tier I Instructions: Candidates who are going to appear in the COMBINED GRADUATE LEVEL Examination must check SSC CGL Exam Tier I Instructions from here through this page. Every time, during an exam process, candidates have to face some difficulties in the rules applying by the Staff Selection Commission in the examination hall like wear Full sleeves shirts, closed shoes and banned of prohibited items which create problem. Here you will come to know the rules applied by the Staff Selection Commission during Tier I Exam which will help you to secure yourself and get alert. Staff Selection Commission is all set to organize SSC CGL Exam of Tier I commencing from 5th August 2017 till 24th August 2017 in order to fill the availabilities of Assistant Audit Officer, Assistant, Inspector, Sub Inspector and others etc. Check the Important Instructions of Combined Graduate Level Examination (Tier-1)2017 which every candidate should follow any how or else they will be disqualified. 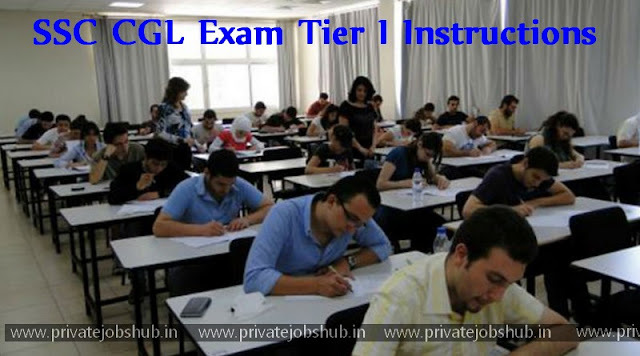 Now get more details regarding SSC CGL Exam Tier I Instructions by going through below specified page which is well represented by the team of www.privatejobshub.in. 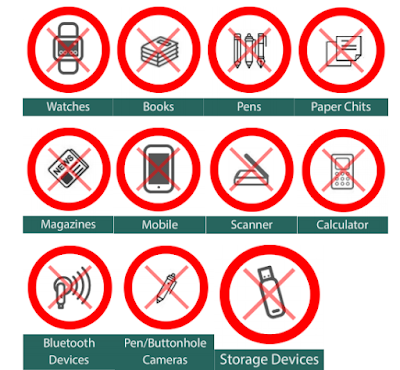 According to the SSC Rules, you are STRICTLY NOT ALLOWED to take such Items like watches; books, pens, paper chits, magazines, electronic gadgets (mobile phones, Bluetooth devices, head phones, pen/ buttonhole cameras, scanner, calculator, storage devices etc) in examination hall. However, if the following items will be finding on your desk during the examination then you will be disqualified at that single moment only without any warning and his/her candidature liable to be cancelled and legal/criminal proceedings could be initiated against him/her. If you carry any of such items in the exam then you have to make your own arrangements to keep it outside the hall. Commission will not be responsible for the safe custody. Contenders should not wear jewelry, veil, items containing metals such as ring, bracelet, earrings, nose-pin, chains, necklace, pendants, badge, brooch, hair pin, hair band, clothes with full sleeves or big buttons, etc. you should wear open footwear like chappal, flotter, instead of shoes. No other supplementary material or equipment are permitted. Candidates who had appeared before for the Combined Graduate Level Examination (Tier-1), 2017 are strictly notified that they are not required to attend this exam. Candidates appearing more than one time for the SSC CGL 2017 Exam will be disqualified from exam as well as expelled for 3 years from all exams organized by Commission. Also you can check the SSC CGL Selection Procedure. Candidates must also refrain from creating any obstruction during the conduct of the Combined Graduate Level Examination (Tier-1), 2017. If you will be found created any disturbance, then your candidature shall be instantly cancelled and you are the only responsible for disqualification from future examinations of the Commission and legal actions. If it is found that the examination was disrupted by the candidates then no re-examination would be conducted at any cost. Candidates who are going to appear in the exam are required to carry their Combined Graduate Level Exam Admit Card along with Identity Proof such as Passport, Voter Id Card, Driving License, Bank Pass Book, Identity Card of University or College, passport size photo for verification. Contenders can only bring their Pen/ pencil and other geometry box at time of examination, a bottle of water with electronic watch. Calculators are not permitted unless the examiner has authorized their use and must be self-powered, without data storage facilities, noiseless and handheld. Arrive 15 minutes before the start of the examination. You are required to obey all the directions which head invigilator is announced. You are not allowed to leave the venue before rang or without permission. If anything in the examination question paper is unclear, you can easily ask from the lecturer without hesitation. Close the papers and off the computer/laptop when you leave your place. Your paper must be written with a black or blue ballpoint pen. After the examination time has expired, you have to close your paper. We hope that all this information will help you to perform your exam alertly and freely. We the team of www.privatejobshub.in wishes you all the very best for your exam. You can join us on Face book or Google Plus to acquire updated messages directly on your wall. You can also subscribe to our mail services to get messages directly in your mail box. For more query and details, you can write your comment in the mentioned given comment box.